the LGBT syndicated international radio program. Harvey Milk was assassinated in 1978, my first year of college. I have a dim memory of the news accounts at the time, possibly because it was not a headline story in the mainstream media. I did not come out until I was 23 -- call it denial or survival, I was not consciously aware of my sexual orientation until then. When I left the suburban working class tract house development of Levittown, Pa., where I had grown up, I wasn't yet out -- but I instinctively moved to the nearest large city. A few years after I had left, a young gay man named Anthony Milano who lived in the same neighborhood where I grew up was brutally murdered. This was the first reported anti-gay hate crime murder, tried as such. 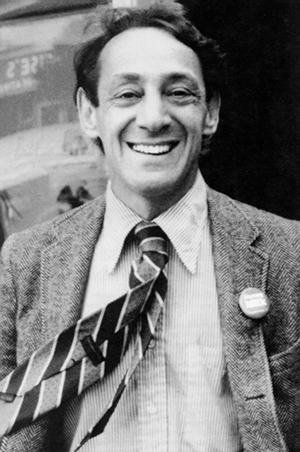 The first time I saw a movie about Harvey Bernard Milk, it was 1984 and I had a ticket for the premier showing at the Roxy movie theater on Sansom Street in Philadelphia. I was twenty five and had come out a few years before. For some reason--maybe I only had one ticket -- I went to the premier alone. I remember standing in line outside the theater with a number of gay and lesbian community luminaries, including Barbara Gittings, the lesbian activist who died last year, and her long-time partner, Kay Tobin Lahusen. Barbara's long list of victories include being part of the movement to get the American Psychiatric Association to drop homosexuality as a mental illness in 1972. Inside the small but cozy theater, the audience was comprised mainly of gay men, with a few pockets of lesbians here and there. The Times of Harvey Milk opened with Diane Fienstein, as the first female President of the San Francisco Board of Supervisors, announcing that San Francisco City Supervisor Harvey Milk and Mayor George Moscone had been assassinated. As the documentary progressed, with the narration of Harvey Fierstein, one of the few openly gay actors at the time, I became aware of an usual sound coming from all around me. I realized, then, that it was the sound of men, sitting in the dark, softly crying. In those days my activist life was divided into two camps, women's liberation -- which is where most of the lesbians were -- and the gay movement, at that time still predominantly men. Often, I was the person who brought the two groups together. I invited Frank Broderick, the then editor of the Philadelphia gay and (newly added since I had begun writing for them) lesbian newspaper, the now defunct, Au Courant, to come speak to a feminist collective I was working with. Frank wanted to know what the little double-sided axe was that one of the women wore on a chain around her neck. He had seen other lesbians wearing this. We explained to him that it was a labyris, a symbol of female strength and independence from pre-patriarchal Minoan times. (There were a few Seven Sisters alumn in the room.) Frank was usually very quiet, with a deadpan look on his face, but I imagine he was has having a good laugh inside. I would never find out how he felt about the meeting, since he died of AIDS in the next six months or so, a swift and sudden casualty of the first stage of the epidemic. I saw Milk over the holidays -- and watched it back to back with the original documentary. Milk, the movie, came across as well-done fictionalized version of the documentary -- with some original archival news footage and an opening scene of gay men being led out of a bar and put into a paddy wagon -- the historic context of our gay lives. Sean Penn plays a convincing, although stereotypically "gayer," Harvey Milk. One of the most poignant scenes in the movie is when Harvey receives a telephone call from a gay teen in a small town in the Midwest, saying he was going to kill to himself but then he saw Harvey on television. Before the conversation was cut off, Harvey manages to tell the young person to move to the nearest city. Harvey Milk was assassinated in 1978, my first year of college. I have a dim memory of the news accounts at the time, possibly because it was not a headline story in the mainstream media. I did not come out until I was 23 -- call it denial or survival, I was not consciously aware of my sexual orientation until then. When I left the suburban working class tract house development of Levittown, Pa., where I had grown up, I wasn't yet out -- but I instinctively moved to the nearest large city (advice that Harvey gave to the young people who called him from samll towns across the country). A few years after I had left, a young gay man named Anthony Milano who lived in the same neighborhood where I grew up was brutally murdered. This was one of the first reported hate crimes. 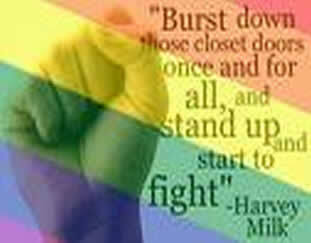 I really didn't know much about Harvey Milk when he was living. I have never been to the Castro (Harvey was the unofficial Mayor of Castro Street), the 1970s Mecca for gay men. But Harvey Milk is my hero, too, and so is Anthony Milano who was so bravely himself in a redneck neighborhood that I had to flee before coming out. We might still have some differences, but today gay men and lesbians are working together -- and we are a force to be reckoned with. It's true, we've had our recent setbacks -- it often feels like the proverbial one step forward and two steps back but we are, in fact, still marching.